Fullerton, California: Digsy AI, the sales productivity software platform for CRE & B2B sales teams has launched three new features to help agents and sales reps automate their workflow and convert more prospects into customers. Among its users are agents and sales reps at CBRE, JLL, Colliers International, NAI Capital, Farmers Insurance and Sandler Sales Training. Digsy AI users now have the ability to automatically sync any emails sent and received from prospects to their Digsy AI contact database. The feature supports syncing with Microsoft Exchange, Office 365, Google GSuite, and many popular IMAP email services like Yahoo & Aol. In addition, users are able to import contacts from their email service contacts database. The company claims that these new features help its users save hours logging sales email activities and creating contacts. Users are be track all communications without having to BCC forgettable email address and pick up conversations with database contacts all from the Digsy AI software platform. The company is also introducing custom email templates. 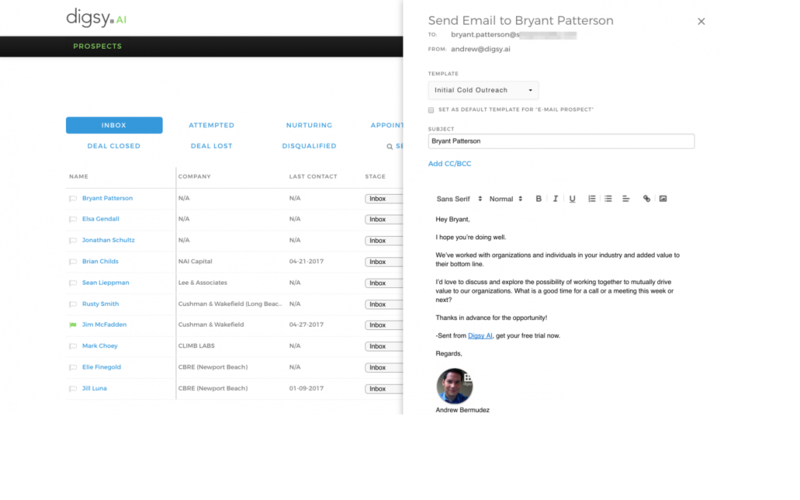 This feature enables users to create pre-set email templates to quickly contact, follow-up or respond to prospects. Users are able to set default email templates for initial contact or follow-up scenarios. Digsy AI claims that this feature enables users to contact and follow-up with dozens of prospects in just under 60 seconds.